The air was as heavy as a hammer and the clouds on the horizon black as anvils. The atmosphere was far more sultry than it had been that morning and Jan was feeling very hot and sticky. Having to fight her way through a hedgerow had not helped. But now she was there, standing at the top of the embankment, looking across the dyke toward the site of the West Gate. Jan knelt down on one knee and leant forward, holding out her right hand and probing with her fingers, as though gently feeling her way through the air. Yes. There it was – only discernible through her sense of touch – the medieval bridge. She could feel it. She could run the palms of her hands across its gently undulating surface of weathered, well-worn planks of solid timber. She leant out a little further until she began to topple over. She automatically put out both her hands as she fell forward. And then stopped – right there, suspended in midair. She stared down through her fingers at the steep sides of the ditch beneath her. This was amazing. Jan jumped to her feet and lifted her left foot slightly off the ground. She looked into the dyke. Now that she was standing, the bottom of the earthwork appeared to be a lot, lot further down, and she hesitated for several seconds before taking her first tentative step forward into empty space. It took her weight. Instinctively, like a tightrope walker, she stretched her arms out either side as she took her right foot off the solid earth of the embankment and stepped forward on to – nothing. At least, nothing she could see. But she could feel it beneath her feet, flat and firm and tangible. She took another step. Then another. She let her arms drop to her sides. She was standing in the middle of the bridge, halfway across the ancient ditch and several metres above it. She stood still for a considerable time, savouring the sensation of … what, precisely, was the sensation she was feeling? Was it floating? No. If she had been floating she would not have been able to choose the direction in which she wished to go simply by walking to the end and back again. She did so, just to demonstrate her point. Neither was she hanging in thin air. That would have implied suspension, whereas she could most definitely feel the bridge beneath her feet, supporting her in the way that bridges always do. She jumped up and down to prove that this was so as well. She even did a cartwheel. In fact, there was nothing special about the sensation at all – at least as regards her sense of touch. It was simply that it emphatically contradicted everything her eyes were telling her. She was not experiencing a new sensation; she was missing an old one. Jan reached for her back pocket. “I must get a photo of this,” she said to herself as she opened the camera app on her smartphone. She moved her legs slightly apart and then took several pictures of the ground between, and some distance beneath, her feet. She lay down on her back and held her phone out in front of her to get a photograph of her head and shoulders hovering in midair. She then sat up and carefully shuffled over to the edge of the invisible bridge, where she twisted round and dangled her legs over the side. As she sat there in the dappled sunlight, her gently swinging feet the only sign of movement, she inspected the photos on her smartphone one by one. If only Hal was here, she thought, he could have got a shot of me from below.As much as she was delighting in the phenomenon of sky walking, it all seemed pretty pointless if there was no one there to witness her aerial acrobatics. Pointless? How could she be so selfish? Jan chastised herself. This supernatural medieval world had not been created for her amusement. It had been brought into being for a specific purpose, and she was supposed to be investigating what that purpose was. 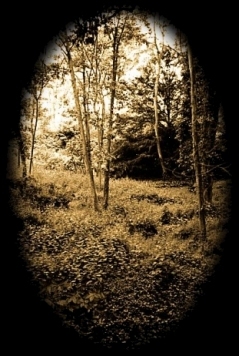 Jan took one last look along the length of the ancient earthwork, glanced down at the undergrowth way beneath her feet, then got up, pushed the phone into her back pocket and walked determinedly to where the West Gate had once stood – and should be standing once again, at least as far as her sense of touch was concerned. Not that she had the chance to test this out. The far side of the dyke was so densely populated by more recent impediments to progress – a thick hedgerow, a rusted barbed-wire fence and the bole of a fallen tree – that Jan did not get the opportunity to reach out and try to feel the contours of the gateway. All her efforts had to be concentrated on simply moving straight ahead. On the far side of the broken fence was a small wood. After the exertion of negotiating the barbed wire and the brambles its cool shade was very welcome. Jan leant her back against a tree and pulled a crumpled map from her pocket. She stared at it for several seconds before turning it the right way up. If she had got her bearings right there should be a building not that far from where she stood. Jan stepped forward and began to raise her arms, and immediately felt something right in front of her. She turned her hands around so that she could press her palms against the invisible surface. It was hard and warm and rough, and she could feel small particles of grit rubbing off on to her fingertips as she began to run them gently across the unseen wall. It appeared to be made of dried mud and straw. She moved sideways, trying to find a window or a door, but the surface disappeared into a tree. With her arms outstretched Jan continued to feel her way down the long lost street, picking her way between the visible foliage of the present and the invisible buildings of the past, trying hard to find something in one world while her eyes were looking into another. Her progress was extremely slow, and sometimes perilous, either bumping into the corner of an unseen house or walking into stinging nettles while engrossed in the sensations of touching and tapping and holding and handling things she could not see. Eventually the wood began to clear and the facades of the buildings became easier to detect. But they lost their fascination as soon as Jan espied the monolithic object standing stark against the sky beyond the trees. She walked toward it as quickly as she dared and came out of the wood on to a narrow strip of land high above the sea. She could hear the distant sound of waves smashing into surf upon the shingle beach below. Seagulls caterwauled overhead. Jan stopped and stared. The scene was dominated by a massive ruined tower – the tower she had seen when she first arrived at Wickwich, the tower of the church in last night’s nightmare. It stood alone, completely desolate, at the top of a sand and gravel cliff, precariously close to the edge of the precipice. The elements had pitted themselves against its walls for centuries – the winds had slashed its fabric and the sea-spray had rubbed salt into its wounds. Jan looked up, past the gouged-out windows to the crumbling crenellations at the top. They bit into the sky like broken teeth.